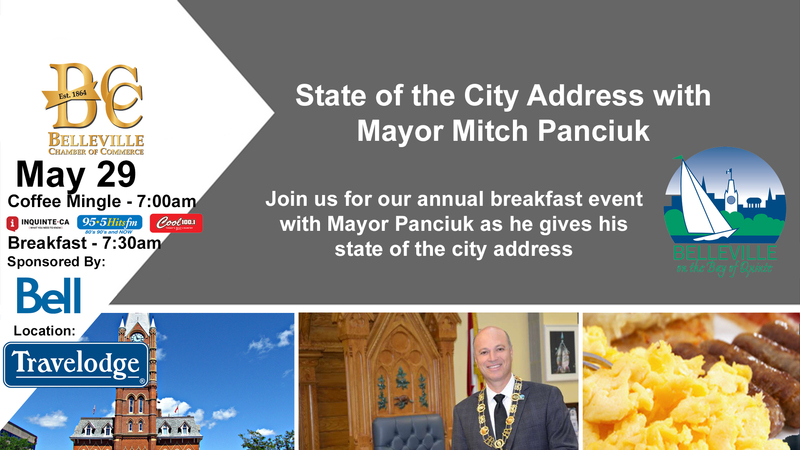 Join us for our Annual Breakfast event with Mayor Panciuk. Mayor Panciuk will join us to speak on the state of the city and discuss what is happening and what will be happening in the future of our great city. Mayor Panciuk was elected Mayor on October 22, 2018 after serving one-term as a Belleville Ward City Councillor. He is a Past-President of the Belleville Chamber of Commerce, Past-Chairman and six-year Board Member of the Quinte Economic Development Commission, a former Vice-President of the Belleville Agricultural Society, Past-President of the Bay of Quinte Basketball Official’s Association and served as an elected member of the National Franchisee Advisory Council for Boston Pizza International among other achievements.